Impact Canine Solutions (ICS) is licensed and registered by the United States Department of Justice, Drug Enforcement Administration. ICS also maintains memberships with the California Narcotic Canine Association (CNCA) and the California Narcotic Officers Association (CNOA). Impact Canine Solutions is dedicated to promoting a drug free environment in schools and businesses by utilizing detection canines to minimize the presence of contraband substances in their facilities. 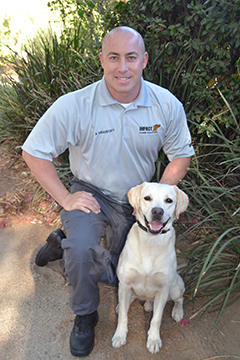 Impact Canine Solutions (ICS) is the premier drug detection canine service provider for schools, businesses and juvenile detention centers. ICS has industry leading canine handlers and drug detection dogs in the business. Our teams are certified to search for and detect minute quantities of an extremely wide range of substances such as marijuana, hashish, cocaine, crack, heroin, commonly abused medications, alcoholic beverages as well as gunpowder- based items/firearms. The dogs can pinpoint areas where drugs have been stored, even when the substance is no longer there. The possession and use of illegal substances is a health and safety problem, especially in schools and businesses where the potential for negative consequences is high. ICS can help you take a pro-active stance in minimizing the presence of illegal drugs and preserving the safety of everyone involved. Our services are tailored to the individual needs of our customers. The goal of ICS is to take drug detection services to a remarkable level, making world class services more accessible to schools, businesses and residential.